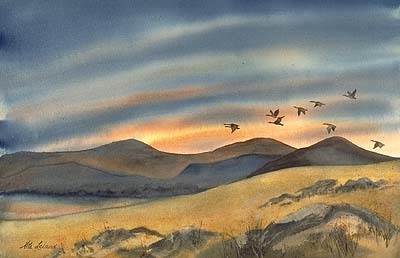 Although this watercolor is based on an area near Boulder, Colorado, I've seen a great many places with these rolling hills. Capturing the light as the sun goes down, I toned the entire painting with that ambient color and contrasted the dark hills and bird silhouettes against the light. Low-key value contrast sets a dramatic mood with a limited palette. I used the compatible palette combination of Brown Madder, Raw Sienna and Indigo to create the ambience. For more information on compatible palettes see chapter five in Exploring Color.